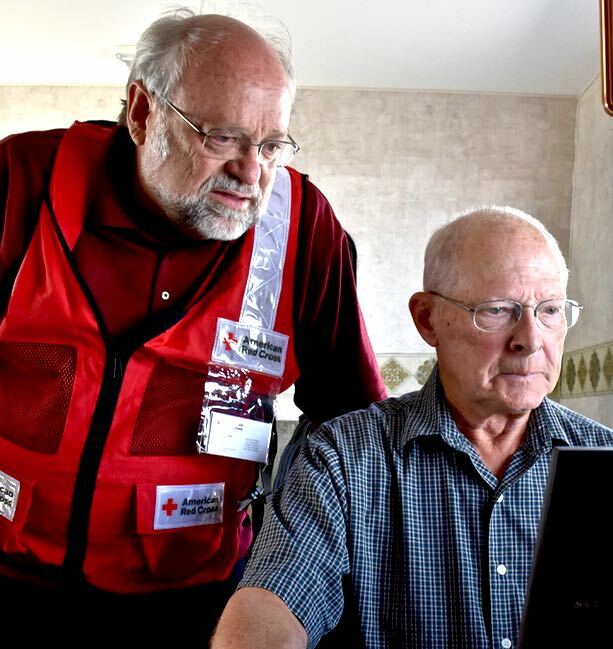 Long time disaster responder Dan Cenis from Spokane, Washington, has answered the call from the American Red Cross numerous times to assist with major relief operations, but this one, the 2015 Washington State wildfires, had a new twist. This time, Cenis was the target of disaster, as well as a disaster responder. American Red Cross volunteer Bob Wallace looks over the shoulder of Kitchen Site Manager Dan Cenis to view images of the remains of Cenis’ remote cabin that was destroyed by wildfire. 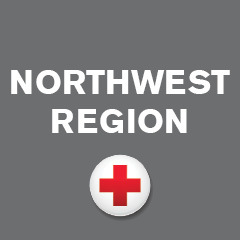 Cenis is an ace Kitchen Site Manager for the Northwest Region of the American Red Cross. In this role he oversees the preparation of meals, usually thousands and sometimes tens of thousands of meals for people whose homes and lives have been disrupted and for disaster responders. This time, however, he learned, while on the job, that a cherished family cabin, one that a young Cenis helped his dad build 62 years ago, had been completely consumed in the wildfires that swept through the Fruitland area of Washington State. Cenis has not had a chance to visit the 120-acre site where the cabin was located, as he has been consumed by his role as a Kitchen Manager. However, his wife and siblings have made the sad journey and have provided him with pictures. After his wife, brother-in-law, and sisters visited the site, Cenis did have a short respite from Red Cross duties to meet with them. “We looked through old family albums, remembered the good times there, and cried,” said Cenis. He went on to recall that as a young adult he had helped his dad plant many fir trees that are now 50-60 feet high. For some reason, they were not consumed by the fire like the surrounding pine trees. 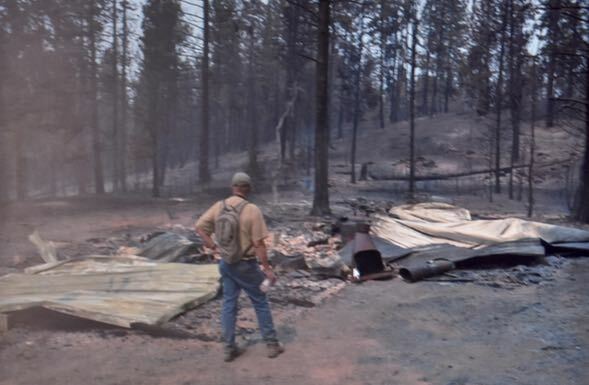 The remains of the Cenis family cabin after it was destroyed by the wildfires that swept through the Fruitland area of Washington State. Photo provided by Dan Cenis. “There were a lot of people who lived full time in the area of our cabin, and I don’t know if they made it or not,” noted Cenis. “But a cabin is just a cabin,” he said as he expressed concern and sympathy for all the people affected by the wildfires who lost everything. “I just can’t imagine that situation,” he concluded. Cenis is an eleven-year volunteer for the Red Cross and this is his fifth year as a Kitchen Site Manager. Often his work, as it does on this deployment, involves collaboration with the Southern Baptist Disaster Relief. Many times the two organizations work together with the Red Cross providing food supplies, the Southern Baptist cooking the food in their mobile kitchens, and the Red Cross using their fleet of Emergency Response Vehicles to distribute the meals to those in need. “It took two years for me to gain the training needed to do this job,” Cenis recalled. A lot of Red Cross resources went into my training, and for that reason, and the dearth of others trained for his role, it’s important for me to keep responding when called, despite my age of 70 years. “You gotta stay active,” he concluded. Thank you P Earl. You were and continue to be the spirit of unity and strength in that lovely community. May God grants you wisdom for the years to come.